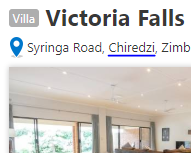 Are you Coming to Victoria Falls and are You Looking for Accommodation? If so this Page has Some Useful Information for You. If you are anything like me, you get completely overwhelmed by the sheer volume of choice and information on the internet. How do you make a decision and how do you know what the accommodation is going to be like? As I know Victoria Falls well, I hope to answer those questions in the next few paragraphs. First, decide on which side of the Falls you are staying Zimbabwe or Zambia, this has obvious implications. Please read our Zimbabwe vs Zambia page to find out more about the differences. This page, however, is focused on accommodation on the Zimbabwean side. 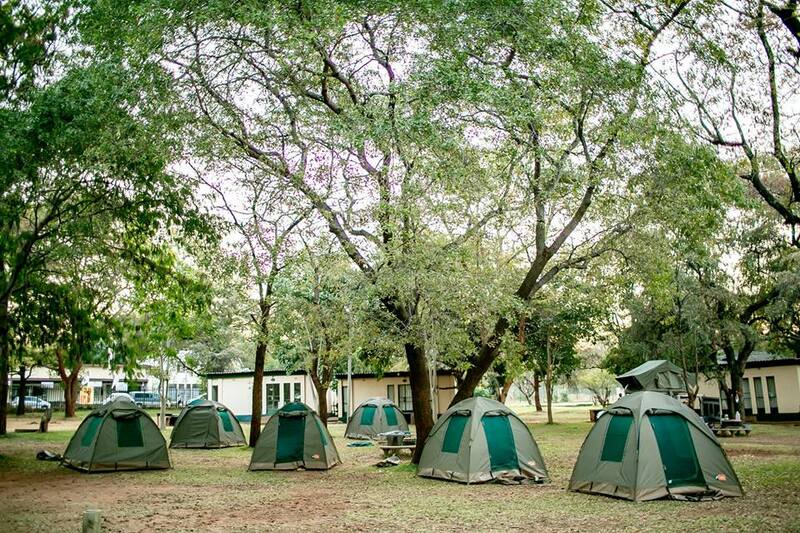 How much is it going to cost for accommodation in Victoria Falls? This open ended question is totally dependent on the experience you want to have. Cheap and simple to expensive and indulgent. There is accommodation available in all price ranges but as every destination is priced differently, it’s important to get to know the prices in Victoria Falls and what you get for your money. This quick reference Table of Accommodation (screenshot below) will help you to see what is available and for what price. Then choose your budget range of High, Medium or Low. 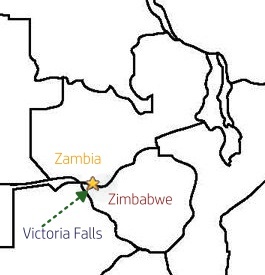 Victoria Falls is NOT considered a cheap destination. Do you get what you paid for? Absolutely – hotel prices range from cheap to very expensive. Cheap does not need to be nasty (although in some cases it very much is). But it is obvious that a luxury lodge offering five star cuisine, silk sheets and a fantastic view is going to be more expensive than a tucked away backpackers lodge. Follow the rest of our advice on this page, work out what you can afford and what you want to experience and match the two. Even better, contact us and we will help you to find the right place, sometimes recommending you spend a bit more or even a bit less to achieve what you want. Understandably so! Even though we have split the Victoria Falls accommodation into different categories (detailed at the end of this page), it can still be overwhelming. Honestly, the best option is to contact us and tell us what your requirements and budget are, we will easily be able to recommend the most suitable places for you. This can save you hours of searching and it doesn’t cost you anything. If you choose to go it alone please read through the rest of this page and be mindful of the warnings offered. Also scroll to the bottom of this page for our Top Picks. Does location close to the Victoria Falls entrance make a difference? In my opinion – not really. Transport is readily available either by a hotel shuttle or taxi at little or no cost. 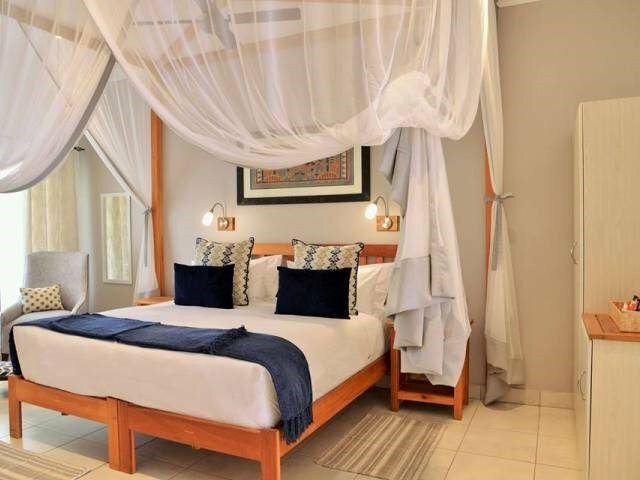 All town hotels and lodges are less than a 10-minute drive from the Falls entrance and almost all Victoria Falls activities that you book will collect you from wherever you are staying. That is with the exception of the out-of-town Safari Lodges and AirBnB's where an additional pickup cost can be incurred. Worried about the quality of accommodation? The reality is that these days you can easily be sold something on the internet that sounds and looks fantastic but when you get there it is terrible. The solution is simple, you have got to check it out. Speak to real people like us who live in Victoria Falls and know the places. Don't book it through some online website where you cannot contact anyone and they are more interested in making money than your experience. Obviously do research on forums like TripAdvisor, but also be slightly cautious of some reviews as they might be biased or untrue. Conversely poor reviews can sometimes also be unfair ones because of an unfortunate and rare situation or difficult client. Victoria Falls has grown dramatically in recent years and there is now a vast array of little lodges that have sprung up everywhere. Certainly not all of these are good and of the standard that they claim to be. So Please do the research. Sceptical about what you read online? Me too! I never know what to trust and what not to. Is the information up-to-date or not? All I can say about our website (Victoria Falls Guide) is that we continually update it with changes as they take place. We add new places that we like, as they are built. We do not have any accommodation displayed on our website, that we are not happy to recommend. Yes, some places are better than others but we avoid the rubbish completely. I can't guarantee that we are perfect but I would like to believe that we have the most current, local and first-hand information out there, and we are easily contactable if you want to verify anything. The same cannot be said of the big booking sites, discussed in greater detail in the next paragraph. I am horrified as to how grossly incorrect some of that information is, including the map locations. It just cannot be used as a basis for planning your holiday. 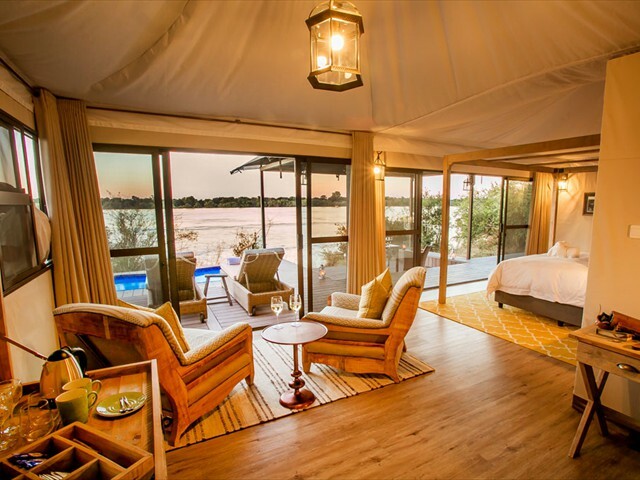 Should you use Large Online Booking Sites to book Hotels in Victoria Falls? These large online booking websites are changing the face of the travel industry. They have immense selling power and have made it possible for any lodge/hotel/guesthouse, big or small to market themselves to a worldwide audience at the push of a few buttons. Trouble is that they don't really screen the establishments that go on their website. They are only interested in volume sales and everyone is welcome. This leads to a great deal of misinformation (see image on the right taken from one of the large booking websites) and false advertising. I am horrified at some of the places I’ve see advertised in Victoria Falls, the photos and descriptions are so far from the actual reality. I cannot stress enough; unless you specifically know a place, don't book it just because the price is attractive, you run a high risk of being conned. However these bookings sites work for some people, who within a few clicks can secure their booking, at what is seemingly a discounted rate. Not having conversed with a single person and just taken a chance. For some though, they prefer to have contact with a real person who can give advice and has local knowledge. That is where our services come in and we are able to assist…for free. People use us for information gathering and then place their bookings through these online giants, I think unaware that commissions is how we too make a living. This is not something we encourage, but our primary aim is for visitors to our country to have a great time, so it is whatever works best for them. How many nights should I stay in Victoria Falls? Statistics show that the average nightly stay in Victoria Falls is 2.8, which means that many people stay for only 1 or 2 nights. It’s deemed to be a quick stop… see the Falls, add in a couple of activities and off you go. However, there is a lot to do and see in Victoria Falls and certainly the feedback we receive is that customers wish they had stayed longer. They had no idea from their overseas agent that there was so much to do, so it’s mostly just booked as an add-on destination. It does depend on your interests, but in my opinion, three nights is an absolute minimum but four or five nights is ideal to truly experience the destination and all that it has to offer. 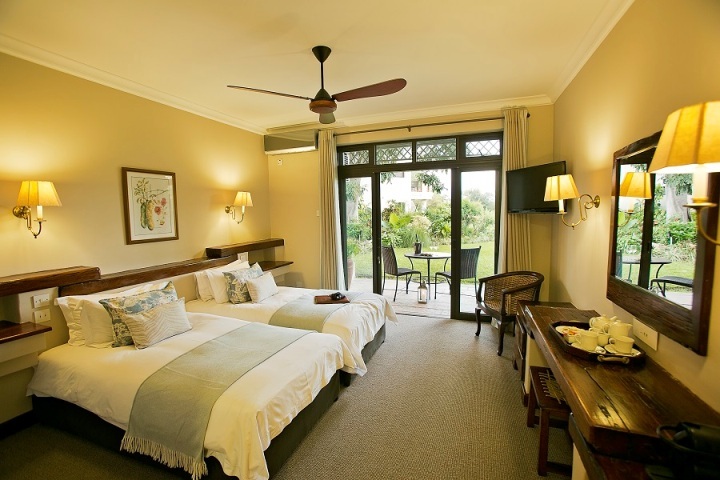 Confused by the different categories of accommodation in Victoria Falls? 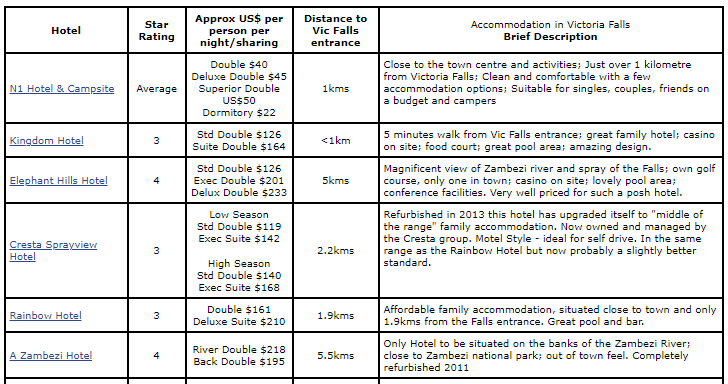 We have broken down our Victoria Falls Accommodation Page into 5 accommodation categories. Each one is going to give you a different experience which I will try to explain. Hotel – These are the bigger accommodation establishments. All situated in prime locations on commercial land in and around the town. Not more than 6kms from the Victoria Falls entrance gate. Good service in most but can be impersonal. Safari Lodges – these are all situated out of town, either in the National Park or on private game reserves and concessions. All are within about a 30-minute or less drive of Vic Falls town. Normally fully inclusive of meals and some activities and suited to those on a higher end budget. Small, upmarket and personalised experience. 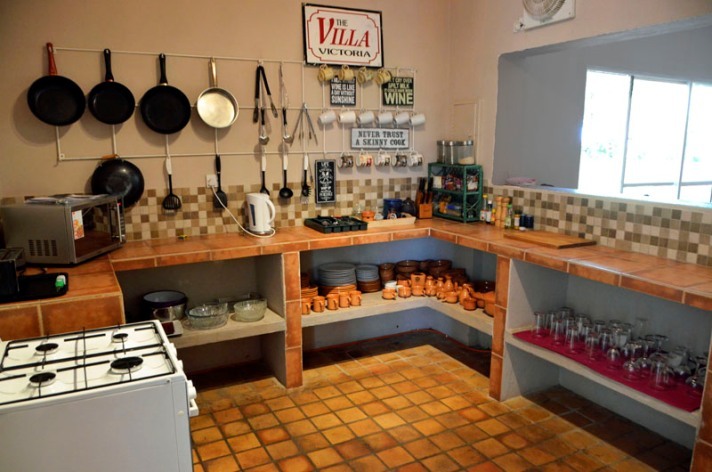 Self-catering – These self-contained units have a small kitchen for preparing your own meals and also a living area. Ideal for families and small groups who prefer to be together rather than in separate hotel rooms. There is not a great deal of choice in this area. They generally work out more cost effective for groups than the other categories. Guest Lodge – This is an ever increasing sector as more and more residential properties get converted into small lodges and B&B’s. No more than 5kms from the Victoria Falls entrance. Some with only a few rooms others like Batonka are quite big. Prices vary from budget to upper end. Often owner run and managed, small and personalised experience. Be careful though on where you choose. Camping/Dorms – Only a couple of campsites around town. Bring your own camping equipment but ablutions are good. Backpackers' lodges offer the cheapest accommodation, normally in the form of dormitories with shared ablutions. Ask Your Question Here About Victoria Falls or Zimbabwe. Enter YOUR question into the form below. After clicking on the "Submit Your Question" button a Thank You page will open. Please read the instructions on that page, it is important that you select a notification option so that you will be notified if we or anyone else answers your question. Once reviewed your question will be posted amongst the questions below but not at the top. When the question has been answered it moves to the top.